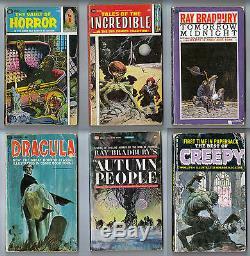 Six hard-to-find vintage Ballantine & Ace/Tempo comic style horror paperbacks in this lot... All in decent shape (see scans). All books have black & white comic panel artwork on the inside. Books you will receive are. THE VAULT OF HORROR, 1965. TALES OF THE INCREDIBLE, 1965. BEST OF CREEPY, 1971 (this one is an Ace/Tempo paperback). You will be happy you did! For every additional book won, please add ONLY 50 cents. The item "TALES OF THE INCREDIBLE, VAULT OF HORROR, BEST OF CREEPY 6 BOOKS 1965 BALLANTINE" is in sale since Monday, February 23, 2015. This item is in the category "Collectibles\Comics\Silver Age (1956-69)\Superhero\Other Silver Age Superheroes". The seller is "ff-xpress" and is located in East Elmhurst, New York. This item can be shipped to United States.